Don't worry, Pandora hasn't left you behind! 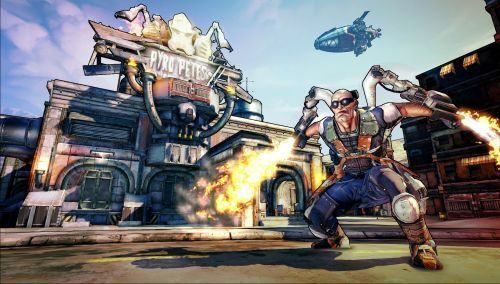 If you're one of the Mac owners out there who purchased Borderlands 2 from the Mac App Store, you've probably noticed a few key features have been, well, almost completely missing. Aspyr Media is here to save the day with a brand new patch that brings things (mostly) up to speed, including achievements, a handful of miscellaneous fixes, and access to leaderboards, all through the safe little garden that is the Mac App Store. The big DLC campaigns can now be grabbed via in-app purchase, including Captain Scarlett and Her Pirate's Booty, Mr. Torgue's Campaign of Carnage, and Sir Hammerlock's Big Game Hunt. Gaige, the fifth playable character and a real badass with a 'bot, is also available. Co-op play has finally been added, though it's limited to Game Center friends and not the Borderlands 2 community at large. Still, it's better than running through Pandora solo.